"Gensō Suikogaiden (幻想水滸外伝) is a two volume series of spin-offs from the Suikoden series of console role-playing games. 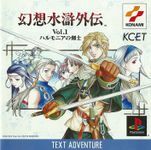 Suikogaiden Volume 1: Swordsman of Harmonia (幻想水滸外伝Vol.1 ハルモニアの剣士, Gensō Suikogaiden Vol.1 Harumonia no Kenshi?) was released in the autumn of 1999; Volume 2: Duel at Crystal Valley (幻想水滸外伝Vol.2 クリスタルバレーの決闘, Gensō Suikogaiden Vol.2 Kurisutaru Barē no Kettō?) was released in the spring of 2001. Both volumes are visual novels, rather than role-playing games the other Suikodens are known for. The games were only released in Japan and never translated into other languages. The events of the game intersect with those of Suikoden II, but are more of a side story, hence the name gaiden. Nash Latkje, the protagonist controlled by the player and an agent of Holy Harmonia's Southern Border Defence Force, has been assigned to obtain information to either verify or disprove a rumour concerning the appearance of one of the 27 True Runes in the Jowston City States. During his travels, he encounters Sierra Mikain, a female vampire, who decides to accompany him on his journey. As a result, he soon becomes entangled in the larger conflict involving the events of Suikoden II." Source: Wikipedia, "Gensō_Suikogaiden," available under the CC-BY-SA License.